On to the next ice cream! Every summer, the company my parents worked for had a huge beach party. This involved copious amounts of food for thousands of people; burgers, hot dogs, snow cones and anything else you can think of. 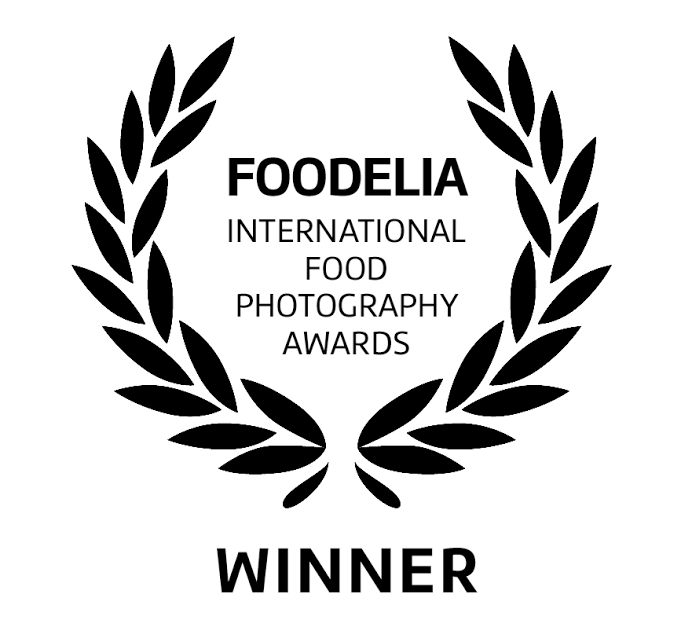 It was all amazing food, but the best part? Ben and Jerry’s ice cream carts. You were able to eat as much ice cream as you wanted! As a kid, this was hitting the sugar jackpot! Of all the tasty flavors, my favorite was Cherry Garcia and it still is to this day. 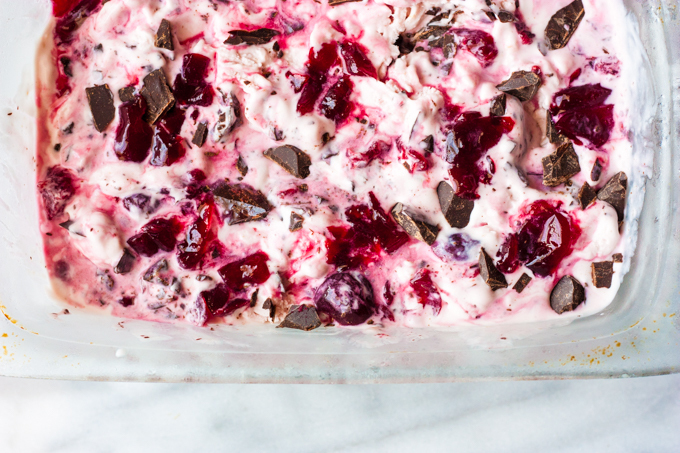 This Sour Cherry & Dark Chocolate Ice Cream is a grown up version of that memory. Chill your base. You want your base to be as cold as possible so the ice cream attachment or machine only has to worry about turning cold liquids into frozen solids, not lukewarm liquids into cold liquids. This will make your life so much easier. 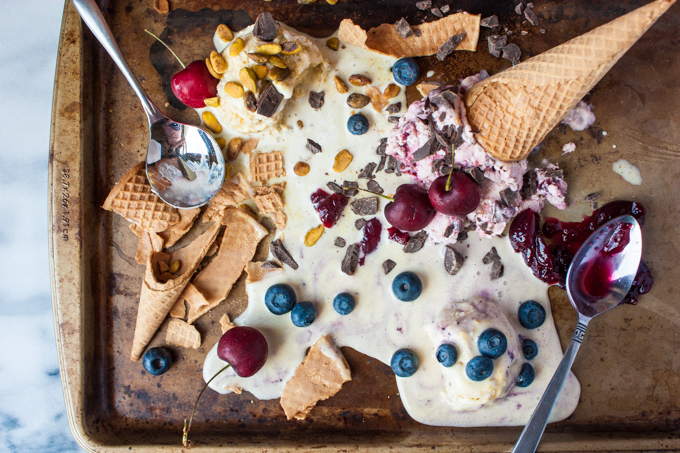 Deep freeze your ice cream attachment. This isn’t your ordinary ice pack. Your ice cream cylinder needs to be frozen solid. It’s going to have to sit outside the freezer and turn a liquid into a solid so you want to give it as much time as possible in the freezer. Unless you have the equivalent of a small AC unit in your machine like those industrial ice cream machines, give your cylinder at least 24 hours in the freezer. If you have an electric ice cream maker, you can run the entire machine in the freezer to get a truly frozen ice cream. I’ve used this basic Cusinart ice cream maker in the past and it’s very easy to figure out and clean. I have the Kitchenaid Ice cream attachment for my professional size mixer, so just make sure you get the right size. Keep everything cold. Something that you won’t think about to keep cold is the container you are going to store your ice cream in. You don’t want your freshly churned ice cream to melt once you put it in it’s final container. Pre-freeze your container so it’s ready for storage. Cover with some extra plastic wrap. While you may store your ice cream in a tupperware or a real ice cream container, everyone can benefit from an additional layer of plastic wrap. Keep the plastic wrap tight to the ice cream and make sure some hangs over the edge for easy removal. This will prevent air from coming in contact with the ice cream and forming those dreaded ice crystals! Store in a loaf pan for easy scooping. To get perfect scoop, store the ice cream in a long container like a loaf pan. This way, you can glide your ice cream scoop easily to make long scoops to form the balls of ice cream. If you heat the scoop in hot water, it will also help the scoop easily glide through. If you want a more official ice cream storage solution, you can also use a long re-usable plastic container. It also fits better in the freezer than a traditional pint container. I (un)luckily purchased five pounds of cherries from Costco and they turned out to be much more sour than expected. Instead of forcing myself to eat them while wincing through the sourness, I decided to make a Sour Cherry & Dark Chocolate Ice Cream. The sauce needs time to cool, so I got it started on the stovetop while I made the ice cream base. Pit your cherries with a small paring knife and roughly chop them before cooking them down in a saucepan with some sugar. I let them simmer until the water reduces out and the sauce becomes nice and thick. While the sour cherry sauce cools, make the ice cream base. Half and half, cornstarch, corn syrup, and a pinch of salt go in a heavy bottomed sauce pot to boil. Make sure the cornstarch is fully dissolved and not lumpy. You can do this by mixing the cornstarch into a small amount of milk and then pouring that back into the pot. Once the milk mixture thickens, take it off the heat and whisk in the cream cheese until dissolved. I also didn’t put any additional sugar in the base, as I plan to use the cherry sauce as the sweetener. Pour in as much liquid from the cherry sauce as you desire. Chill the base in the fridge. Once the base is chilled, churn to the manufacturers instructions. Fold in the sour cherry sauce liquid, reserving some as a topping. Fold in chopped dark chocolate as well. I chopped the chocolate finely and tried to shave thin pieces off the block. I didn’t want huge chunks of frozen chocolate to chip anyones teeth! 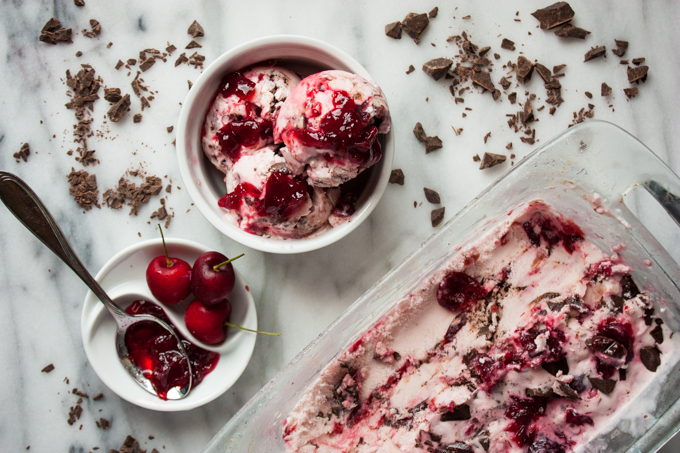 This Sour Cherry & Dark Chocolate Ice Cream went the fastest because it is a crowdpleaser. Who can dislike cherries and chocolate? Some of my taste testers didn’t like the sour aspect of the ice cream, which is something you can mitigate by adding a little more sugar to the cherry sauce. This batch turned out both tart and sweet, but you can control how strong each flavor is with the amount of sugar or a squeeze of lemon juice. If you cover the ice cream with plastic wrap as well as the lid to the storage container, you can minimize those dastardly ice crystals. Let the ice cream sit out at room temperature for 3-5 minutes before serving for easy scooping, but once you’ve served it, stick it back in the freezer! 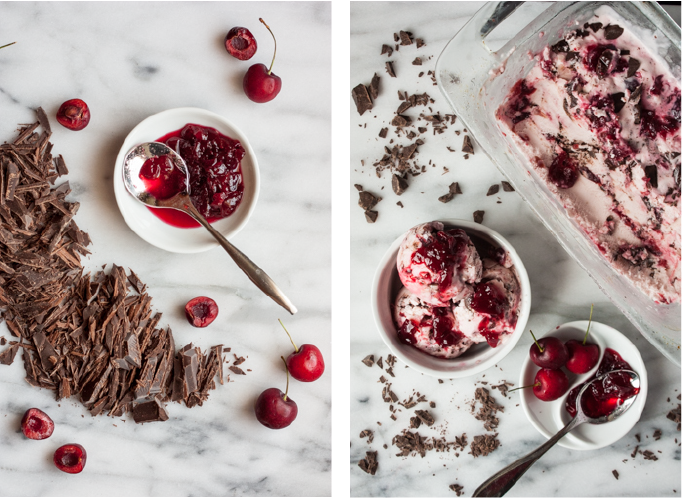 Serve your Sour Cherry & Dark Chocolate Ice Cream in a bowl with extra cherry sauce or on top of a chocolate dipped waffle cone. Yeah. Go do that. I’ll wait. 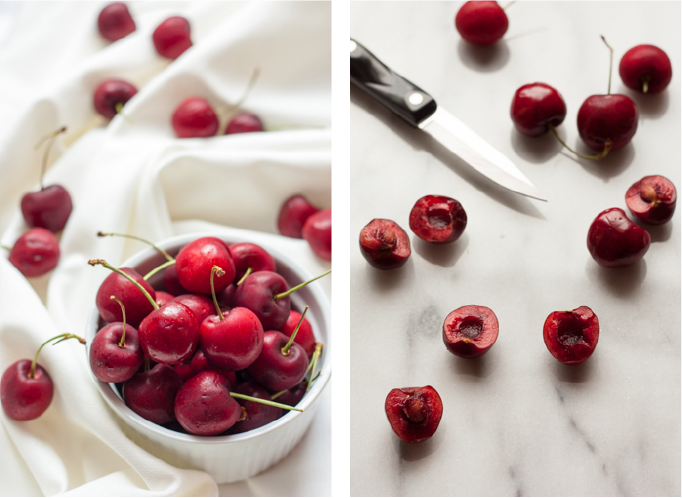 Pit and chop cherries. Combine the cherries, vanilla and sugar in a large heavy saucepan. Add 1 cup water and the lemon juice and bring to a boil over high heat, stirring occasionally. Reduce the heat and simmer for 15 minutes, or until the mixture begins to thicken. Let the sauce comes to room temperature and then cover and refrigerate. In the bottom of a medium bowl, whisk the cream cheese until loose. Set aside. In a small bowl, whisk together the cornstarch and 2 tablespoons of the half and half, making sure the cornstarch is dissolved. Pour the rest of the half and half into a heavy sauce pot and whisk in the sugar and corn syrup. Bring to a boil over medium-high heat, and then simmer, stirring frequently, for 4 minutes. Remove from heat and whisk in the cornstarch mixture. Return the pot to medium-high heat, bring back to a boil, and cook for 1 more minute, stirring or whisking constantly, until the mixture is slightly thickened. Pour the warm milk mixture into the cream cheese and whisk until the it is smooth and combined. Add a pinch of salt and the liquid from the cherry sauce. Let the base come to room temperature before refrigerating. Churn the ice cream according to your machines instructions. Fold in the chopped chocolate and the cherry sauce. Transfer the ice cream to your final storage container and freeze for at least 6 hours until firm. Still a fat kid at heart.